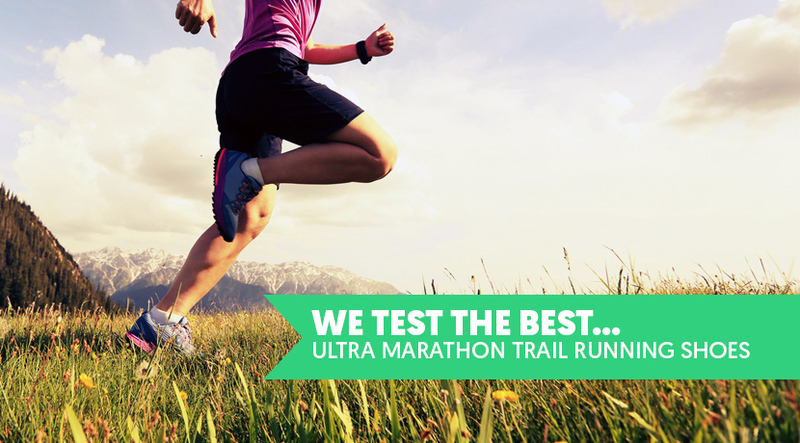 What Are The Best Trail Running Shoes for Ultra Marathons? Over the last few years, ultra marathons have exploded in popularity! In this guide, we take a look at 5 of the best trail running shoes for ultra marathons. In a regular road marathon, you can get away with lightweight shoes that offer little comfort or protection. But once you start stepping up the distance, looking after your feet becomes a top priority! What Makes A Good Ultramarathon Shoe? The piece of rubber at the bottom of the ground that makes direct contact with the ground plays a significant role in the performance of any shoe. It needs to be large and have aggressive lugs for a firmer grip on the ground. In addition, good outsole will be made from durable rubber. The lugs should be spaced for easy shedding of mud. Considering that you will be running a relatively long distance, choosing shoes that offer added support and stability is more important than the barefoot experience. The last thing you want is your feet to get exhausted before the second half of the marathon. Look for something that will lend you the kind of stability and support needed for long races. The extra support may be just what you need to make it to the end. There is a good reason why some brands such as inov8 and Hoka One are famous for their trail running shoes. These companies invest a lot of resources not just in marketing, but also in the designing and manufacturing phases to ensure that the consumers get the worth of their money. Sticking with a major brand is a good way of ensuring that you don’t experience the disappointment that comes with cheap and poor quality shoes. The Hoka One One Clayton is an incredibly lightweight shoe with a decent level of responsiveness and cushioning. It offers more stability that most shoes thanks to the integrated Oversize Active Foot Frame. Rather than a rubber compound, Hoka One One uses an exclusive RMAT compound for the outsole. The compound provides good traction and bounciness, hence increased bounciness. Using foam in the place of rubber allows the Clayton to remain lightweight without compromising overall performance. The lug pattern provides good traction on all kinds of surfaces. A mesh material on the upper of the shoes allows for adequate ventilation while the welded TU overlays provide a good fit and structure to the upper. The midsole is double layered for softer, more protected landings as well as more efficient take offs. As for comfort, the integrated PRO2LITE technology in the midsole area provides enhanced comfort and efficiency. Hoka One One also uses early stage Meta-Rocker Technology to promote smoother rides. Originally intended as a cross country running shoe with spaced out studs, the Inov-8 X-Talons 200 is arguably the best trail running shoe. Its main selling point is that it has enhanced flexibility that allows it to mould to the ever changing terrain as you run the marathon. The rubber outsole provide added grip while a 3mm differential between the forefoot and heel allow for enhanced stability. Inov-8 incorporates 8mm cleats with rope technology for improved traction. The midsole is injected with EVA cushioning for shock absorption. This cushioning also has memory foam properties, hence more comfort. A reinforced synthetic mesh upper does a good job of ensuring that preventing your feet from getting wet or coming into contact with mud while running. Your toes are also protected from bruises by rubber toe bumpers while gripped laces and TPU overlays ensure a snug fit. The Peregrine 3 from Saucony provides a nice balance between serious durability over technical trails and lightweight design. It features plenty of traction and support where runners need it most and lightweight material where they don’t. And while it may seem a little heavier than expected, this is a nice tradeoff between a dedicated ultra marathon trail running shoe and a lightweight trainer. What makes it really stand out from other models is that it comes with a thoroughly threaded and thick outsole for an excellent grip on rough terrains. There is an adequate amount of cushioning to protect you from hard impact on the trail. The upper of the shoe features a flexi-film layer that is fused with a lightweight mesh fabric, thus providing a good fit while still reducing the weight. Some customers cited that the toe box is narrow, which is a must for trail running. While this is a savvy design element, you may want to look for a wider toe box if you have wide feet. The New Balance Leadville 1210 is a good example of a trail running shoe that applies the knowledge of minimalist shoes and pushes towards a shoe specially built for ultra marathon trail marathon. At 10.3 ounces, the Leadville 1210 is neither light nor heavy. It offers a good fit and has an 8mm drop, which allows you to get closer to the ground without straining the Achilles. The Leadville 1210 comes with a Vibram outsole, which has a reputation for durability and lasting long. There are forward and backward facing lugs that provide enhanced traction and grip on the ground. A full-on heel break towards the outer back of the heel does a good job of preventing sliding. The TPU is infused with N2, a low-profile type of foam designed for trail running. New Balance uses Revlite and a dark grey foam for the midsole. This is a helpful for those who have a lot of miles during the week or when the form starts to slip a little bit. The upper has a toe bumper at the apex to protect against bruises as well as leather on the sides with an plastic or rubbery type of overlay. This helps protect from soggy feet. The Brooks Adrenaline GTX is the kind of trail shoe you need if you run in variable or adverse conditions. It comes with a Gore-Tex® membrane that allows runners to go almost anywhere, regardless of the weather. The membrane will be waterproof when you run in wet conditions and still make it possible for your feet to remain dry and well ventilated in warm weather. Another feature you will love is the HPR outsole, which is sufficiently lugged for good traction on rough and slippery surfaces. The shoe weighs 10.7 ounces, which is a little heavier than most minimalist shoes. The tradeoff is that you get touch shoes that will allow you to run anywhere. Also featured are four stretchy shoelace eyelets that allow for a customized fit when you lace up. Overall, the Brooks Adrenaline GTX is a great all-terrain shoe that ultra marathon trail runners will love. It holds true to the manufacturer’s claims and the black with teal accents keeps it looking good after the longest races. Shopping for the best ultra marathon running shoes (of in fact any trail shoes) isn’t the easiest task given the many choices at your disposal. Which ones offer the right amount of drop? Do they allow for breathability? How comfortable? All of these are just a few of the important questions that need to be answered before making a purchase. While it doesn’t tick all the boxes, we love the Hoka One One Clayton as it offers a nice balance between stability and function without sacrificing durability. The foam outsole provides added stability and shock absorption. You also don’t have to worry about bruises on your toes when you hit rocks as the toe box offers sufficient protection. So there you have it, 5 of the very best trail running shoes for ultra marathons and while they wont make your next ultra any easier, they’ll certainly make it more comfortable!